Home » » Why Small Family is happy Family? Why Small Family is happy Family? The small family is always a happy family. In a small family, there are parents & one or two kids are included. Now a day’s especially in urban cities, couples are planning to have one or two kids only. The reason behind this thought is the later marriage, effective methods of contraception, girls are focusing on their career and continuous increase in the cost of living and education. India is the world second largest populated country after China and based on the united nation estimates, the population of India is more than 135 Crores. This overpopulation has become one of the major problems for the developing country like India. A small family is the need of this time especially for a developing country like India. The rate at which our population is increasing, we can easily estimate the scarcity of basic amenities like food, water, clothes, shelter, etc. The small family is required not only to avoid the situation of scarcity but also for matching the living standards according to the world. What is the small family norms? 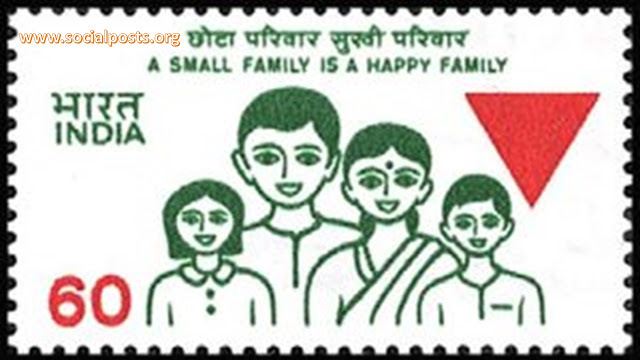 In 1952, the Government had launched the concept of family planning in India. “Hum Do Hamare Do” (We two, our two) is the slogan given by the Indian government to promote the small family as the happy family concept in India. The meaning of “We Two, Our Two” is to have only two kids of the married couple. It was launched to promote awareness in a married couple to have two children. Population control is a technique that limits the population of the country. There are several reasons that support population control. We have summarized a few of them below. • Basic Requirements like Food, water, clothes, etc. are available in limited quantities on the earth. These resources will exhaust if the population is not under control. • With the continuous growth in population, humans are using more resources from the environment and due to huge consumption of resources, the health of the environment is also degrading day by day. 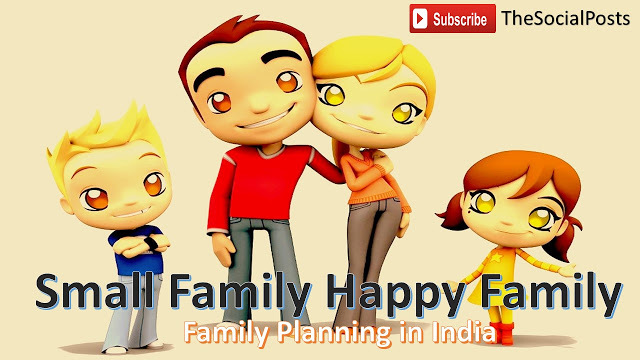 The government department which is responsible for formulating and executing the family planning in India is the Ministry of health and family welfare. 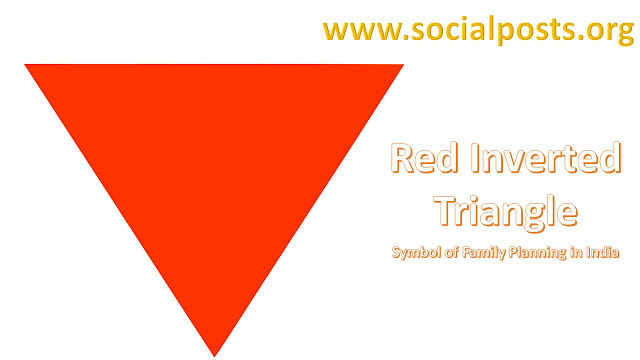 Government is using an inverted red triangle symbol for family planning and contraceptive services in India. • A door to door campaign to promote small family norm. • 2 child family norms should be practiced. • Maintain a gap between the births of two children. • Monetary incentives given to peoples to adopt the small family norm. What is the benefit of small families? Though there are few disadvantages of small families, still small family is always a happy family and there are several reasons supporting this fact. We have tried to list down a few of them. • In small families, parents have a better opportunity to spend time with the kids and kids will receive more love and attention from their parents. In this manner, the environment of the family becomes happier. • Every member of your family has a cost. The cost of living would be higher in large families and vice versa. Parents can give healthy and best life to their kids especially in small families. There are several other advantages of small families such as low family budget, good quality life, healthy lifestyle and so on. These are the reasons that support the small family as a small family is always a happy family. It is very important for our country to move towards small family otherwise the quality of life will continue to be far away in comparison to the world's living standards. The resources are available in limited quantity and if the population will continuously increase at the rapid rate, the day will come when these resources will not available. The quality of life is not good in our country as the mass population is chasing very few available resources. It is a well-known fact the small percentage of the population of our country is following the world’ living standards but the majority of the population is below the poverty line. In order to achieve the living standards as per the global level, everyone should move towards a small family to become a happy family. Like our Facebook Page & Find us on Instagram as well. What is Kargil Vijay Diwas? What is World Earth Day 2019 Theme? What's The Future of Electric Vehicles In India? Why are air conditioners harmful for the planet? Why plastic bags should be banned in India?